The Oculus Rift VR headset can take you to incredible fictional places, like scene from gorgeous movies like Interstellar or Spirited Away. Last night, it took me somewhere more grounded in reality, but still spectacular: my own personal, deliciously retro '80s arcade. 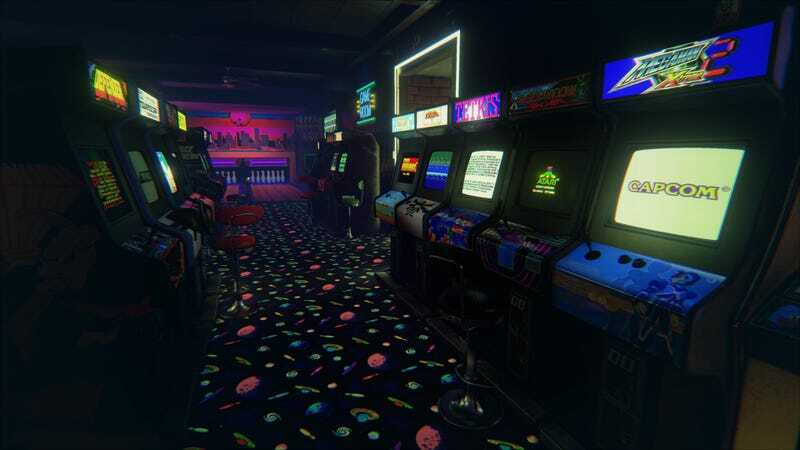 The New Retro Arcade, by Digital Cybercherries, easily ranks among my favorite virtual reality experiences thus far. That could be because I'm a nerdy gamer, sure, but it also could be the incredible variety of things you can actually do inside this CRT-tastic game palace. Yes, that's a video. Press the play button! Walking along the ridiculously patterned carpet and taking in the dizzying deluge of light and sound, I found that I could play practically every arcade game I laid eyes on, with their buttons and joysticks actually responding to my commands as digital "scanlines" occluded their old-school CRT screens. But you don't have to have your nose stuck in a virtual arcade cabinet the whole time; there's also a fully operational two-lane bowling alley, a working dartboard, two basketball machines, and a bunch of original Game Boy handhelds lying around, all playable. You can even find cassette tapes with '80s music and stick them into a boombox, then carry it around the arcade with you. Because what's cooler than playing Missile Command while jamming to The Final Countdown? Hit "Expand" to check out the insane attention to detail on this Game Boy.